Bettina Anner demonstrates pincha mayurasana. Pincha Mayurasana, the “feather of the peacock” position, is an elegant looking and quite difficult yoga posture in which you are balancing on your forearms instead of just on your hands. It’s a bit ahead of where I’m “supposed” to be in the ashtanga intermediate series but, like a lot of ashtangis, I do play around from time to time with asanas that are a bit more advanced than what I “should” be doing. Right now I have decided to do more than dabble with pincha mayurasana, because it requires a lot of shoulder mobility. One of my biggest physical challenges in yoga is that I have very tight shoulders from rock climbing and years of working hunched over desks (or, as I am now, sitting in half lotus on the floor hunched over my laptop). Pincha mayurasana should help. I have always found it a daunting posture. Learning any upside down balancing posture almost inevitably involves a certain amount of falling over, and the further your head is from the floor the scarier that is. I learned to tuck my head and roll out of headstand years ago, but I always assumed it would be a lot more difficult and scary to do it from a position where my head wasn’t already on the floor. 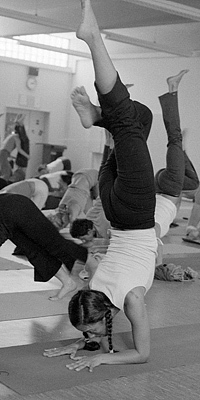 Not so, as it turns out, but for a long time I was put off by remembering my mate L learning pincha mayurasana in Mysore. (I will not name L in full here, on the offchance that he might not like his yoga students reading about his former foibles and failings). 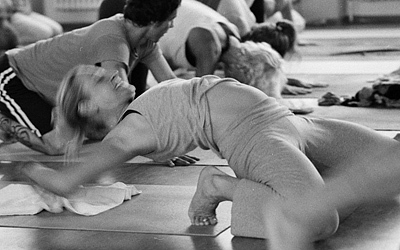 Every morning for what seemed like weeks, L would kick and flail his feet up into pincha mayurasana only to crash down, still kicking and flailing, onto the mat of the woman opposite, usually landing round about where her head was. As the days went by the poor woman started to look more and more nervous (quite understandably) as the moment for L’s attempt at pincha mayurasana drew near. Spend half an hour one afternoon practicing kicking up, tucking your head and doing a forward roll out of the position. This turns out not to hurt at all on the nice thick new yoga mat my wife got me for Christmas. Now that you’re not afraid any more, get it in a week. I realise now that this is another thing I could have learnt years ago if only I’d been paying attention. At a workshop I went to once – admittedly in a session where I was taking photographs and not doing the class – the teacher had everybody practice the tuck and roll thing. The main thing that struck me at the time was that two of the students – my teacher and my wife’s teacher – were persistently doing it wrong. They were both so happy and comfortable in the position they looked like they couldn’t imagine why anybody would want to fall over from it; when they finally were persuaded to come down they had to be told off for elegantly arching over into backbends and placing their feet lightly on the floor instead of falling. That Disclaimer Again: taking advice about how to do difficult yoga asanas from random strangers on the internet may not be the wisest thing you could possibly do.